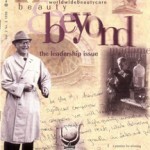 These are three examples of the newsletter Beauty & Beyond, which I edited for Clairol from 1997 to 2001. I wrote all of the stories for every issue and worked with a wonderful designer and administration and it was a truly wonderful experience. In 1998, we we highlighted leadership at the company by tracing the similarities between the impressions of leadership communicated by the company’s president and those of a wide variety of employees across the company. In 2001, we celebrated the company’s rich history on its 70th anniversary. Download a pdf of the leadership issue here. Download a pdf of the anniversary issue here. Download a pdf of the innovation issue here.